We are using thousands of videos in our day to day life for some or other purpose. Many times it happens that we need to upload videos over the web or send them to others in different formats. But when it comes to converting a video, you usually back off as you think it's going to be rocket science and you will require expensive software. In fact, there are many helpful converters available to easily convert videos from one format to another. If you want to convert videos from MOV to FLV files for uploading to the social sharing sites, then you’ll need the video converter to get the work done. 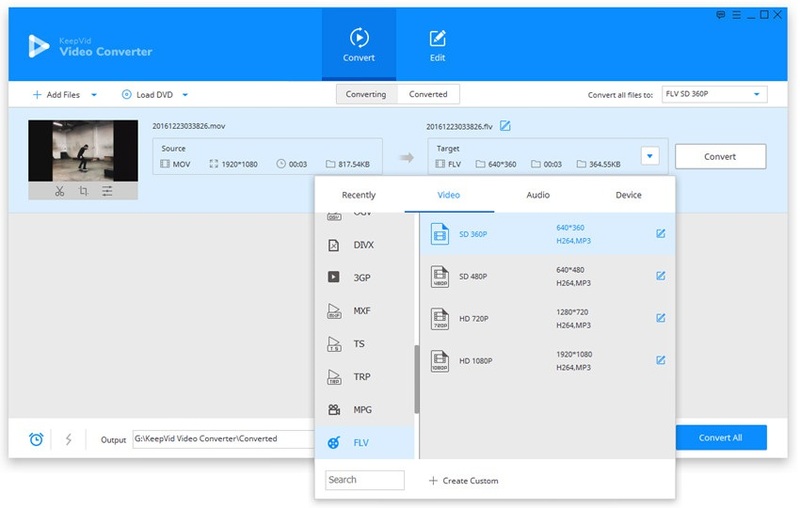 In this article, we’re going to introduce the helpful online and desktop video converters to convert MOV to FLV files. 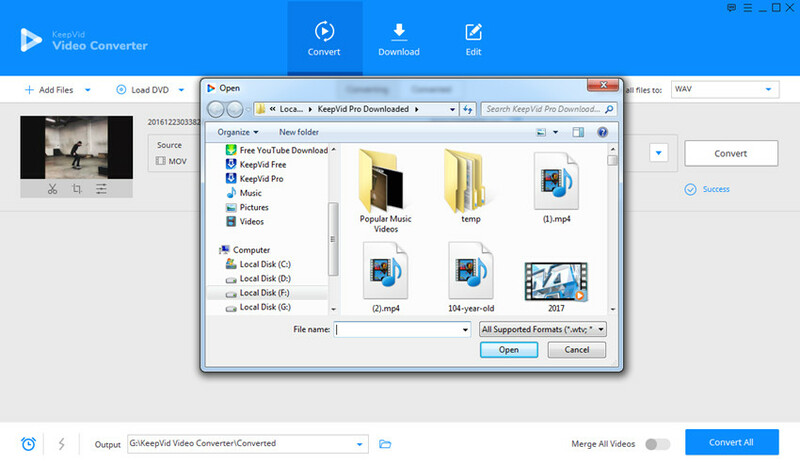 KeepVid Video Converter is a desktop program that you can use to convert MOV to FLV videos. 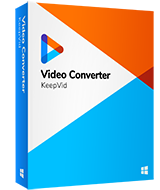 KeepVid offers both Windows and Mac versions for video converters so that you can convert MOV to FLV on your computer without any issue. This video converter provides a very easy-to-use interface, so you can handle the whole converting process in easy steps. The following guide will show you how to use this converter to convert MOV to FLV. Convert videos for any of your device, including iOS, Android and more. This video converter enables you to convert videos with 30x faster speed. It enables you to edit videos with helpful trimming, cropping and adding effects features. Step 2. Select FLV as an output and click the Convert button to start converting MOV to FLV. Step 3. When the conversion finishes, you’re able to get the converted file in the Converted tab. Download the software package and install it on your system. 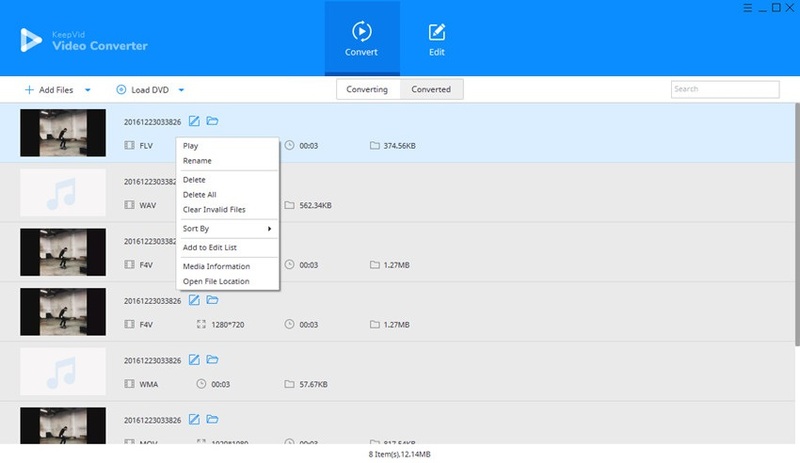 You can choose the Convert section and click the Add File or Add Folder button at the upper left corner of the main interface to add MOV video from your computer. The program will show you the detailed information of the video. Now click the inverted triangle at the right side of the Target area, and select FLV as an output. Or you can click the inverted triangle icon at the right side of the Convert all files to button and choose FLV as output in the pop-up dialog. Click the Convert or Convert All button to start converting MOV to FLV videos. The program will display the process of the conversion. When the conversion finishes, you’ll get the converted files in Converted tab. Or you can right-click the video and choose Open File Location to find the video in your computer. Besides converting MOV to FLV, you can also convert FLV to MOV with the help of KeepVid video converting solutions. The solutions can help you to finish the task in short time. • To speed up the conversion, you can switch on the high-speed conversion tab within the video converters. • If you want to change the location for your converted videos, you can click the Folder icon at the bottom of the main interface. • Set up the parameters before converting the videos. Different settings will lead to totally different results. There are many MOV to FLV online as well as desktop video converters which can help you to convert videos easily, but it’s difficult to pick up the best ones from all the converters. In this part, we are going to introduce 3 of the best MOV to FLV online video converters. KeepVid Online Video Converter is an easy way to convert the videos online using browser. 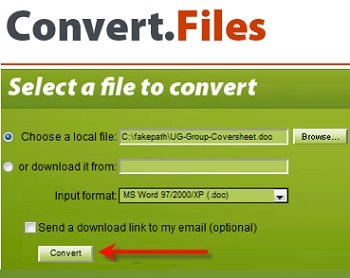 This converter is 100% free and very easy to use. The converting speed of this online converter is faster than the other websites. You can easily convert the videos from the MOV to FLV format with this online converter. 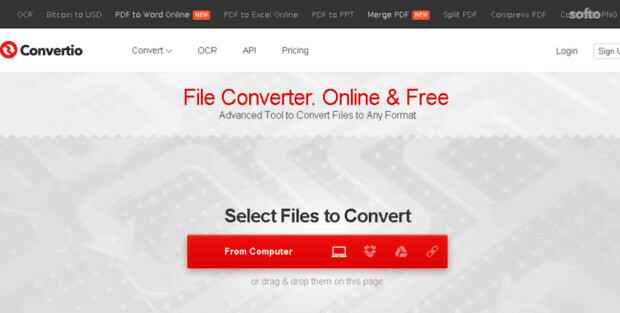 It also supports other 50+ formats to convert files for free. This is another video converter website which easily converts and downloads the videos from one format to another like MOV to FLV. It is totally free and very fast to use. You can simply go online and convert your videos to any format over there. Convertio.co is another free online video converter website that can covert from MOV to FLV. You just need to add the files to the online website and choose the format of the file you need to convert. You can then download the file in that format.